Housing starts for single-family units remained at their lowest level since 1991 in January, according to data released Thursday morning by the Commerce Department. 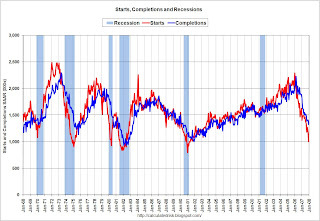 Starts registered a seasonally-adjusted rate of 1.012 million to start 2008, 0.8 percent above December's revised 1.004 million rate but 27.9 percent of of January 2007's pace. December's starts were revised downward from the originally reported 1.006 million last month. Single family starts came in at 743,000, 5.2 percent below December's downwardly-revised 784,000 figure, suggesting that builders are continuing to pull back on new building activity amid the worst housing downturn in at least five decades. Permits fell as well, dropping 3 percent to 1.048 million on a seasonally-adjusted basis; single-family permits fell 4.1 percent to a rate of 673,000. Completions rose 1.8 percent, suggesting that while builders are paring back inventory, there is still some significant 'overhang' in terms of inventory; oversupply is cited by most economists as one of the factors most affecting conditions in the primary mortgage market. The January residential construction report was largely within economists' expectations, with Bloomberg reporting that the median forecast for starts was 1.01 million, while permits had been forecast to drop to a 1.05 million rate. Calculated Risk offers great analysis of core economic reports such as this; the graph to the right is used with permission, and depicts starts and completions longitudinally. In assessing January's numbers, the blog's eponymous author said that he expects residential construction employment to fall over the next few months as completions drop further. "The builders are still starting too many homes," he said, "but they are getting there."